Yes, it’s a big day for speculative renders. But this one comes from patent drawings, and it may show where BMW is taking its electrified i-series next. Is this the BMW i5 sedan? Looks like it. BMW’s i-series of electric and hybrid cars is sort of like a delicious bagel, doughnut, or other torodial snack: there’s a huge hole in the middle. 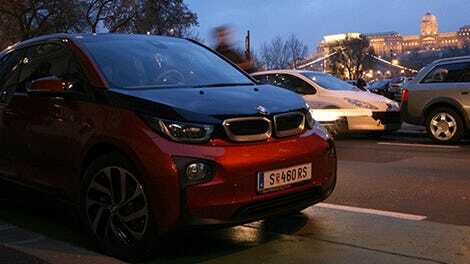 There’s the city-car-like i3, and the super-car-like i8, but nothing in between. Well, not yet. 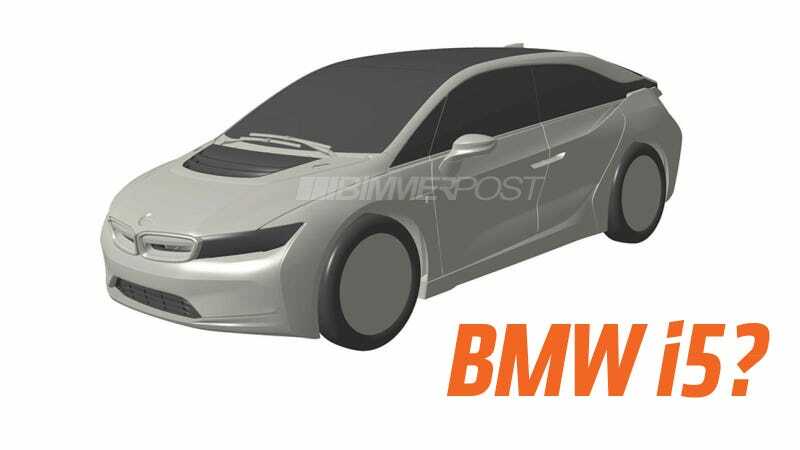 The unreleased BMW i5 is expected to fill that role, and now, thanks to some patent images revealed over at Bimmerpost, we have a pretty good guess of what it may look like. Now, there’s a lot of rumor flying around here: nothing has been officially announced, and these patent images, registered in Japan, don’t come out and explicitly say they’re for the i5, but based on the design, it seems a pretty safe bet. The i5 is the car BMW expects to be the most direct challenger to the Tesla Model S. It’s expected, in pure electric form, to have a 225 HP rear-axle-mounted electric motor, and a 135 HP motor up front. A hybrid variant with a front-mounted three- or four-banger combustion engine to drive the front wheels is also likely. Design-wise, there’s a very clear familial resemblance to the i3 and i8, and I think that’s smart. There’s the trademark broken C-pillar and the wide kidney, um, panels, up front, now relegated to just providing corporate identity instead of having to intake cooling air, too. The overall shape has the familiar Prius-like tall-hatch look, a shape mostly dictated by aerodynamic concerns. There’s interesting details as well, like the very Tesla Model X-like door handles that meet on the B-pillar, suggesting a rear suicide door. Also, I’m guessing those wheels are just not designed yet and not smooth, featureless discs, but I can dream. It appears to be a full hatch at the rear, along with generous use of blacked-out panels (similar to the other i-series cars) to provide contrast and some character and detailing. There’s a notable set of cooling vents on the hood at the base of the windshield, which is roughly above where the primary EV controller electronics are usually mounted, and those do tend to generate a lot of heat. If this is actually the i5, I think it’s a pretty strong design, and I’m quite curious to see it with transparent windows and all the other details of an actual car.